Pancreatic islet - normal. Normal islets in a control male B6C3F1 mouse from a chronic study. Pancreatic islet - hyperplasia. 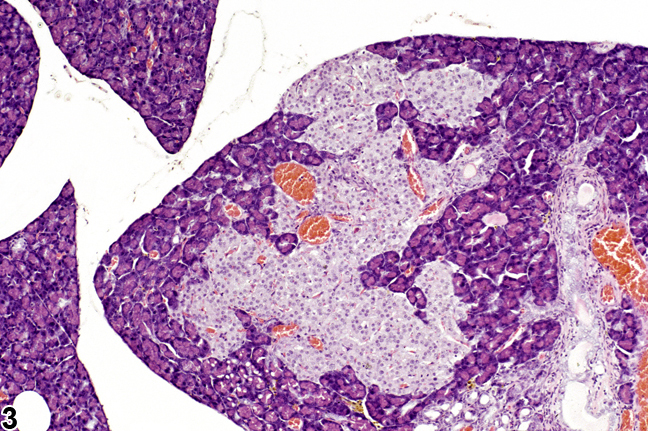 Section of pancreas represents mild islet hyperplasia in a control male B6C3F1 mouse from the same chronic study as in Figure 1. Pancreatic islet - hyperplasia. Three large hyperplastic islets are present in the pancreas in a male B6C3F1 mouse from a chronic study. Pancreatic islet - hyperplasia. 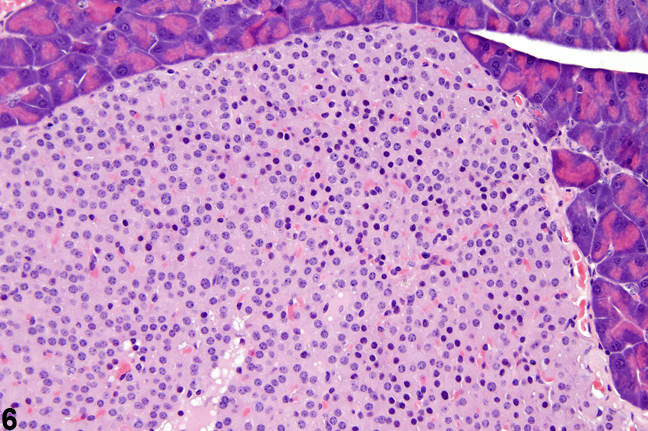 Higher magnification of one of the hyperplastic islets in Figure 4, in a male B6C3F1 from a chronic study. Pancreatic islet - hyperplasia. 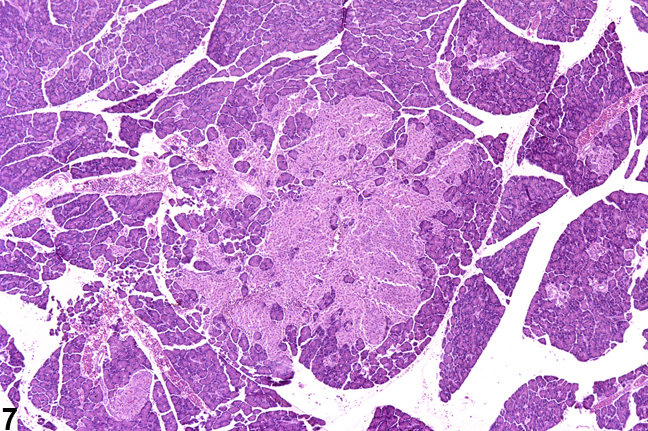 Higher magnification of the hyperplastic islet in Figure 5, in a male B6C3F1 mouse from a chronic study. 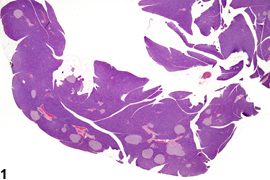 Note the lack of compression of the adjacent acinar parenchyma. 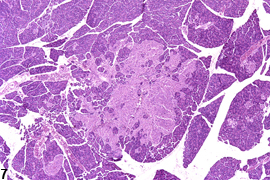 Pancreatic islet - hyperplasia. Several adjacent coalescing hyperplastic islets are present in the pancreas in a male F344/N rat from a chronic study. Pancreatic islet - hyperplasia. 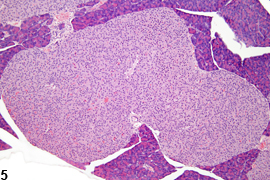 This higher magnification of Figure 7 shows coalesced hyperplastic islets with occasional trapped acinar cells within the hyperplastic islet tissue in a male F344/N rat from a chronic study. Pancreatic islet - hyperplasia. 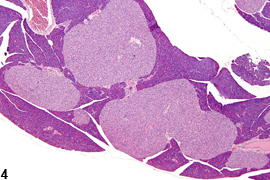 Hyperplastic islet tissue with an irregular border is present in the pancreas in a male F344/N rat from a chronic study. In mice, islets vary greatly in size, ranging from 50 to 300 micrometers in diameter. Since islets in mice are considered to be an expanding population with a doubling time of 500 days, their size would be expected to increase with age. Because of this size variation, it may be difficult to definitively diagnose hyperplasia. When islets are more prominent, they may appear to have increased in number. 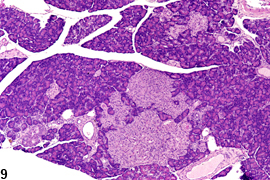 However, mice are reported to have a relatively constant 1,000 islets per pancreas. 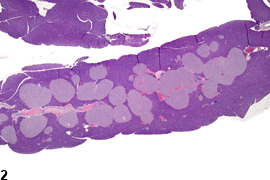 Islet cell hyperplasia occurs spontaneously in mice and rats and may be dramatic in mice. It is often age associated and typically involves multiple islets. In rats, islet cell hyperplasia occurs more frequently in males than females. If there several islets greater than 300 micrometers in diameter, a diagnosis of islet cell hyperplasia should be made. Also, if the overall area occupied by the islets in a section of pancreas is greater than that of the controls, a diagnosis of islet cell hyperplasia may be appropriate. Affected islets may be contiguous, giving a lobular appearance ( Figure 3 ) or distinctly separated ( Figure 4 ). The distinction between hyperplasia and adenoma is largely influenced by evidence of compression in adenomas and lack of compression in hyperplasia ( Figure 5 and Figure 6 ). In islet cell adenomas, there may be some cellular atypia or pleomorphism, which is not typically seen in hyperplastic lesions. Occasional acinar cells may become trapped within coalescing hyperplastic islets ( Figure 7 , Figure 8 , and Figure 9 ) and should not be confused with invasion of an islet cell carcinoma. 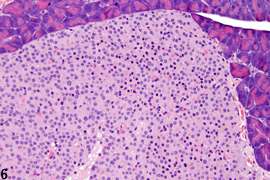 Islet cell hyperplasia should be documented when present and given a severity grade. Severity grading is determined by both size and number of affected islets. 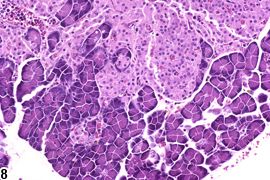 If there is evidence of treatment-related effect and/or the presence of islet adenomas in a given study, the pathology narrative should provide the diagnostic features used to distinguish between hyperplasia and adenoma (e.g., lack of compression, atypia, or necrosis in hyperplasia) and address the magnitude of any treatment-related response. Boorman GA, Sills RC. 1999. Exocrine and endocrine pancreas. In: Pathology of the Mouse: Reference and Atlas (Maronpot RR, Boorman GA, Gaul BW, eds). Cache River Press, Vienna, IL, 185-206. Frith CH, Sheldon WD. 1996. Hyperplasia, adenoma, and carcinoma of pancreatic islets, mouse. In: Endocrine System (Jones TC, Capen CC, Mohr U, eds). Springer, Heidelberg, 297-303. Greaves P. 2007. Histopathology of Preclinical Toxicity Studies: Interpretation and Relevance in Drug Safety Evaluation, 3rd ed. Academic Press, Amsterdam, 528-537. Riley MGI, Boorman GA, Hayashi Y. 1990. Endocrine pancreas. In: Pathology of the Fischer Rat: Reference and Atlas (Boorman GA, Eustis SL, Elwell MR, Montgomery CA, MacKenzie WF, eds). Academic Press, San Diego, 545-553. Tucker MJ. 1998. The endocrine system. In: Target Organ Pathology (Turton J, Hooson J, eds). Taylor and Francis, London, 311-334.